If there’s one thing that Marvel could learn from some of DC’s more recent comics, it’s that weird crossover series uniting characters from entirely different companies can make for some incredibly fun stories. 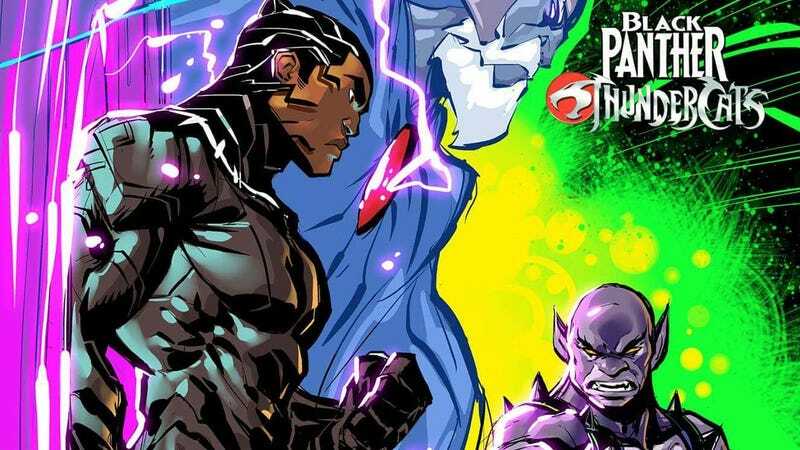 It’s an idea that Atlanta-based artist Marcus Williams keenly understands and wanted to make happen with his Black Panther/ThunderCats fanfic. Though the Wakandan king and the Thunderians share an obvious fondness for felines, Williams’ art taps into the longstanding belief that Panthro was always meant to be read as the ThunderCats’ resident black team member. Though the significance may not resonate with some, seeing T’Challa teaming up with Panthro is almost like a validation of the kinds of fantasies that black kids had while growing up in the ’80s—back when powerful black characters weren’t nearly as prominent in mainstream genre fiction as they are today. Williams’ story follows T’Challa as he travels through an interdimensional wormhole after Jaga reaches across time and space to warn him of the ThunderCats’ impending doom. It’s exactly the sort of out-there team-up that Marvel could have done back in the late ’80s when it still published ThunderCats comics under its Star Comics imprint. But now that the ThunderCats rights are with DC, fanfiction like this will have to do. You can read an excerpt from Williams’ story below and check it out in full (with more art) on his Facebook page. No stranger to interdimensional travels and all things otherworldly, T’Challa happened upon a familiar yet faint reading coming from his universal galaxy scanner within Wakanda’s labs. Further inspection of the beacon’s source began a swelling heat within T’Challa’s chest. Puzzled as to the whys and what’s, it wasn’t long before the King of Wakanda was grasping tightly at his core, teeth clenching with pain. As his eyes shut from reaction, a blazing image of a panther surrounded by a red sphere flashed brightly inside his minds eye. The jolting shock of red forces his eyes open to ensure his sanity and mind are still grounded in the physical. With a number of controlled breaths, the king focuses on the pain and calms his mind and softly closes his eyes to contemplate on the pulsing energy and imagery. With his next moments searching the depths of his rational consciousness, T’Challa concludes that this feels similar to his interactions with Bast, but this was very foreign from anything he’s ever felt. A calling. A summoning, but from who? Why? Before these questions could be answered, a cloaked figure began to form in the king’s mind. The figure introduced himself as Jaga, and made plain his intentions for reaching out to the cosmos for help. While caution tugged at the back of T’Challa’s mind, the king could feel the spectre’s urge and desperation. It was Jaga’s wish to open a gateway to his world so that those that he cares for could be rescued from certain doom. He went on ensure that because Black Panther has received the rallying call from the Eye of Thundera light years away, it was proof that he must be tied to the Thundercats’ life force in some manner.